Trombonist Kai Chresten Winding (pronounced ki-win-ding) was one of the founding fathers of be-bop music and truly one of the finest-ever jazz trombonists. As a sideman to bop’s reigning kings, he was adept at putting a defining stamp on others’ compositions – a trait he picked up while outlining the artistry of Stan Kenton’s sound during the mid 1940s. Kai was born on May 18, 1922, in Aarhaus, Denmark. He came to the United States with his family in 1934. In 1940, he made his professional debut as trombonist with Shorty Allen’s band. He played with the bands of Sonny Dunham and Alvino Rey before joining the U.S. Coast Guard during World War II. After 1945, he worked with Benny Goodman’s highly popular band and moved onto Stan Kenton’s orchestra. Thereafter, he hooked himself up with a number of emerging stars of be-bop, the “new jazz,” and recorded prolifically – most notably, as part of one of the nonets featured on the historic THE BIRTH OF THE COOL (Capitol/1949). In 1961, Winding began recording for the Verve label – the period this discography is most concerned with. 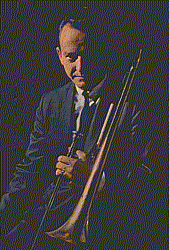 After a long and artistically fulfilling career, Kai Winding succumbed to a brain tumor in a New York hospital on May 6, 1983, just shy of his 61st birthday. Kai Winding's bop legacy has been kept alive in a variety of worthwhile reissues and countless compilations. However, one hopes that major labels will concede to acknowledge the considerable contribution Kai Winding made during the 1960s as part of Verve Records.